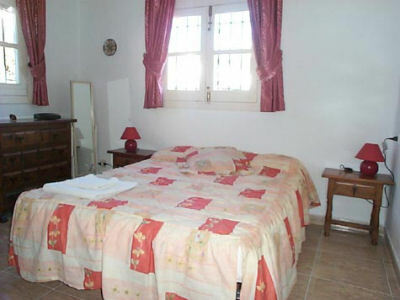 This pleasant 2 bedroom pueblo villa offers you ideal holiday accommodation at a very affordable price. It is situated in the ever popular Capistrano village which has two large outdoor pools, a baby outdoor pool, a well stocked mini market, restaurant and two bars. There is parking outside the villa, which is positioned in a cul de sac. There are 12 steps up to the front door, but once inside it is all on one level. The floors are newly tiled throughout. The lounge has comfortable seating, T.V. satellite via cable which receives many English channels, a music system/radio which plays c.d’s and tapes, a feature fireplace and a ceiling fan for the warmer months. The compact open plan kitchen area has a fitted breakfast bar, light coloured fitted units, a free standing cooker with 4 ring hob and electric oven, a microwave and a fridge freezer. 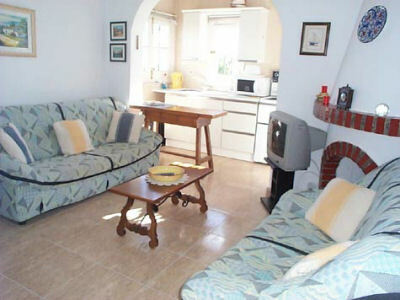 From the kitchen there is a pleasant terrace with patio table and chairs and two sun loungers. There are views to the sea and mountains from here, and it is South facing receiving sun all day. There are two bedrooms, the first has a double bed, drawers, fitted wardrobes, bedside tables and lights. The second has two single beds, two fitted wardrobes and a bedside table and light. There are two mobile air coolers/heaters which are coin operated. 6 hours of lovely cool air for only 1 Euro and 4 hrs of heat for only 1 Euro. The bathroom is nice and bright, being newly fitted and fully tiled having bath with shower over, wash hand basin, w.c. and washing machine. Capistrano village is very popular with holidaymakers, who not only enjoy the amenities offered but also take great pleasure in strolling through the many paths and walkways which are very well tended and offer a profusion of colour and greenery everywhere you look.